First of all, I wanted to thank everyone for their kind words on our big announcement. Mr. Cleaver and I appreciate each and every one. It also appears that March is quite the month for blogger babies, from the number of comments I received from ladies with similar due dates! 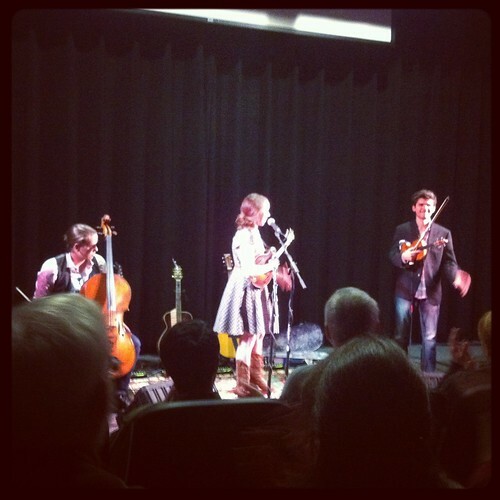 In the first of what will be many full Fall weekends, Mr. Cleaver and I caught a cozy Sarah Jarosz show at USM. If you're not familiar with this bluegrass musician yet, I'd highly recommend you check her out. She has a fabulous voice and is no slouch on the mandolin/banjo/guitar either. Also, seeing her adorable outfit really confirmed my need for a pair of cowboy boots someday. 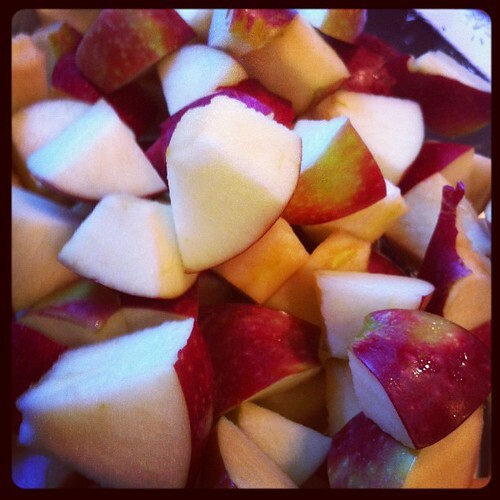 I utilized about a third of my massive bag of freshly picked apples in a pair of apple crisps. I'm thinking this coming weekend will be the big pie-making event. One of the crisps went to Bristol's for our first (massive!) 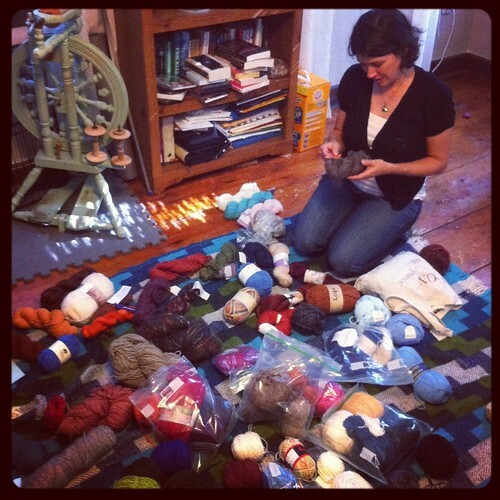 yarn swap. The pile of odd balls in the photo above was already well-picked over by this time, and doesn't include the three other piles of sock yarn, sweater lots, and 3-4 balls. When it comes to yarn, I managed to leave with less than I came, taking only a Zauberball and a sweater's worth of purple Blue Moon BFL DK that I want to be a cardigan yesterday. I did however, also come home with a grocery bag full of jersey fabric and a cut of nice wool. I've been venturing into the land the sewing with knits and free fabric to practice with is always appreciated it. Lastly, I had hoped to share my first maternity sewing project with you, but I started guessing on the tutorial instructions halfway through, and had to spend to quality time with a seam ripper this morning, so it'll be a bit on that one yet.